Material is available under a Creative Commons Attribution - NonCommercial - ShareAlike 3.0 License unless otherwise noted. Swan, M. 2019. Quantified Self. Quantified Self. In Gellman, M., Lattie, E., Eds. Encyclopedia of Behavioral Medicine. Springer. Swan, M. 2019. 1) Introduction, 2) Blockchain Economic Theory: Digital Asset Contracting reduces Debt and Risk, 3) Blockchain Theory of Programmable Risk: Black Swan Smart Contracts. In Swan, M., Potts, J., Takagi, S., Witte, F., Tasca, P., Eds. Blockchain Economics: Implications of Distributed Ledgers - Markets, communications networks, and algorithmic reality. London: World Scientific. Swan, M. 2019. Blockchain Economic Networks: Economic Network Theory of Systemic Risk and Blockchain Technology. In Treiblmaier, H., Beck, R., Eds. Business Transformation through Blockchain. Palgrave Macmillan. Swan, M., and Brunswicker, S. 2018. Blockchain Economic Networks and Algorithmic Trust. Americas Conference on Information Systems (AMCIS). New Orleans LA, August 16-18, 2018. Swan, M. 2018. Blockchain Enlightenment and Smart City Cryptopolis. CryBlock'18 Proceedings of the 1st Workshop on Cryptocurrencies and Blockchains for Distributed Systems. Munich, Germany. June 15, 2018. Pages 48-53. Swan, M. 2018. Blockchain consumer apps: Next-generation social networks (aka strategic advice for Facebook). CryptoInsider. Swan, M. 2018. Blockchain for Business: Next-Generation Enterprise Artificial Intelligence Systems. In Raj, P., Deka, G.C., Eds. Advances in Computers. Vol. 111. Blockchain Technology: Platforms, Tools and Use Cases. London: Elsevier. Swan, M. Submitted. Toward a Social Theory of Dignity: Hegel’s Master-Slave Dialectic and Essential Difference in the Human-Robot Relation. In Robots, Power, and Relationships. Eds. Julie Carpenter, Francesca Ferrando, and Anthony Milligan. Swan, M. 2017. Anticipating the Economic Benefits of Blockchain. Technology Innovation Management Review. 7(10): 6-13. Swan, M. & de Filippi, P. 2017. Introduction, In Toward a Philosophy of Blockchain. Swan, M. & de Filippi, P., Eds. Metaphilosophy. New York: Wiley & Sons. 48(5):603-19. Swan, M. 2017. Is the Blockchain Economy Ushering in a New World Economic Order? The Bitcoin Hard Fork, SEC's ICO Ruling and Hayek’s Multiplicity of Currencies. In Bitcoin Magazine. Swan, M. 2017. Big Data Theory. In Encyclopedia of Big Data. Laurie A. Schintler and Connie L. McNeely, Eds. Switzerland: Springer International Publishing. Swan, M. 2017. Is Technological Unemployment Real? Abundance Economics. In Surviving the Machine Age: Intelligent Technology and the Transformation of Human Work. Eds. James Hughes and Kevin LaGrandeur. London: Palgrave Macmillan. 19-33. Swan, M. 2017.Included Middle. Response to The Edge Question 2017:What scientific term or concept ought to be more widely known? John Brockman, Ed. Swan, M. 2016. Derrida’s Perdurant Temporality and a New Theory of Time as Discrete-Continuous. 5th Derrida Today Conference. Goldsmiths, University of London. 8th – 11th June 2016. Swan, M. 2016. The Future of Brain-Computer Interfaces: Blockchaining Your Way into a Cloudmind. Journal of Evolution and Technology. 26(2). Swan, M. 2016. Rethinking Authority With The Blockchain Crypto Enlightenment.Response to The Edge Question 2016: What do you consider the most interesting recent news? What makes it important? In Know This: Today's Most Interesting and Important Scientific Ideas, Discoveries, and Developments. John Brockman, Ed. New York: HarperCollins. 564-7. Kido, T. and Swan, M. (Symposium Co-Organizers and Paper Co-Authors). 2015. Ambient Intelligence and Crowdsourced genetics for understanding Personal Cognitive Biases in Decision Making. AAAI 2015 Spring Symposia: Ambient Intelligence for Health and Cognitive Enhancement Stanford CA, March 2015. Swan, M. 2015. Blockchain: Blueprint for a New Economy. Sebastopol CA: O'Reilly Media. Swan, M. 2015. We Should Consider The Future World As One Of Multi-Species Intelligence. Response to The Edge Question 2015: What do you think about machines that think? John Brockman, Ed. Swan, M. 2014. Journal of Evolution and Technology, Special Issue: NonHuman Personhood (Volume 24 Issue 3). Personhood and Subjectivation in Simondon and Heidegger. 24(3). Swan, M. 2014. The Non-Cruciality Of Personal Identity: Immortality As Possibility In The Prospect of Immortality: Fifty Years Later. Charles Tandy, Ed. Ann Arbor MI: Ria University Press. 385-420. Swan, M. 2014. The Scientific Method. Response to The Edge Question 2014: What scientific idea is ready for retirement? John Brockman, Ed. Swan, M. 2014. Nanomedical Cognitive Enhancement and Top Ten Recent Nanomedical Advances. In Clinical Nanomedicine: from Bench to Bedside. 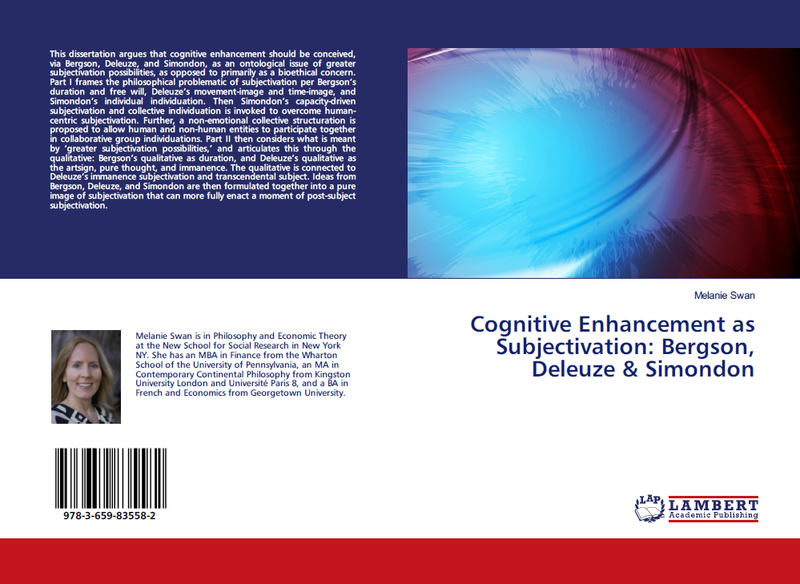 Raj Bawa, Gerald F. Audette, and Israel Rubinstein, Eds. Singapore: Pan Stanford Publishing. Volume 1. 73-102. Swan, M. 2013. Neural Data Privacy Rights: An Invitation For Progress In The Guise Of An Approaching Worry. Response to The Edge Question 2013: What *Should* We Be Worried About?. John Brockman, Ed. Swan, M. 2012. Next Node Foment. Response to The Edge Question 2012: What is your favorite deep, elegant, or beautiful explanation? John Brockman, Ed. Swan, M. 2012. Earning One's Multicurrency Life in Economy 2.0. In Desirable New World. Diverse, Sustainable and Creative Life in 2042. Enthusiasmo Cultural Ltda. & Deheinzelin, C., Eds. Sao Paulo, Brazil. 48-49. Swan, M., Hathaway, K., Hogg, C., McCauley, R., Vollrath, A. 2010. Citizen Science Genomics as a Model for Crowdsourced Preventive Medicine Research. J Participat Med. 2:e20. Swan, M. 2010. Multigenic Condition Risk Assessment in Direct-to-Consumer Genomic Services. Genet Med. 12(5): 279-88. PDF; Supplemental Digital Content XLS; side-by-side loci and SNP comparison by condition: mobile apps, web app, and featured at Access DNA; DIYgenomics citizen science studies. Personal genome: data analysis challenge, August 12, 2010, Cold Spring Harbor Laboratory 3rd Annual Personal Genomes meeting, Cold Spring Harbor NY, August 10-12, 2010. Rational growth in consumer genomics, June 6, 2010, Consumer Genetics Show, Boston MA, June 2-4, 2010. Individuals to drive personalized medicine era, January 24, 2010, Personalized Medicine World Congress, Mountain View CA, January 19-20, 2010. Preventive medicine and Docs vs. Genomics, October 4, 2009, National Coalition for Professional Education in Genetics (NCHPEG) 12th annual meeting, Bethesda MD, September 23-24, 2009. Personalized genomics inflection point, September 20, 2009, Cold Spring Harbor Laboratory 2nd Annual Personal Genomes meeting, Cold Spring Harbor NY, September 14-17, 2009. Genomics: highest-impact near-term advance, June 14, 2009, Consumer Genomics Show, Boston MA, June 9-11, 2009. Stem Cell Research and Aging, Buck Institute for Research on Aging, Novato, CA, March 1-2, 2012. 40th annual meeting of the American Aging Association, Raleigh NC, June 3-6, 2011, summary, journal article. Third Bay Area Aging meeting summary, University of California, Berkeley, Berkeley CA, May 8, 2011. Second Bay Area Aging meeting summary, Second Bay Area Aging Meeting, Stanford University, Stanford CA, December 4, 2010. Translational antiaging research, February 2010, Fourth annual SENS (Strategies for Engineered Negligible Senescence) Foundation conference, Queens’ College, Cambridge UK, September 3-7, 2009. Aging research: systems biology, genomics and new tools, January 10, 2010, Systems Biology Symposium of Aging, Buck Institute, Novato, CA, November 10-13, 2009. Progress in Aging: Secretome, mRNA and Nutrients, December 13, 2009, Systems Biology of Human Aging, U.S. National Institute on Aging, Baltimore MD, December 8-9, 2009. MMP inhibitor to kill senescent cells, November 15, 2009, Systems Biology Symposium of Aging, Buck Institute, Novato, CA, November 10-13, 2009. Aging is solvable, June 7, 2009, American Aging Association 38th annual meeting, Phoenix AZ, May 29 – June 1, 2009. Opportunities in level-two nanoscience, May 3, 2009, The future of computing – rotaxanes?, May 31, 2009, Reference guide to current nanotechnology research, May 3, 2009, Foundations of Nanoscience, Snowbird UT, April 20-24, 2009. Foundations of bio-info tech convergence, 2nd annual Unither Nanomedical and Telemedical Technology Conference, Magog Quebec, February 24-27, 2009. Programmable RNA and other recent advances in synthetic biology, December 18, 2011, Synthetic Biology, University of California - San Francisco, San Francisco CA, December 14, 2011. Synbio revolution: biology is the engineering medium, June 26, 2011, Synthetic Biology 5.0: The Fifth International Meeting on Synthetic Biology, Stanford University, Stanford CA, June 15-17, 2011. Synbio in space, October 31, 2010, NASA Synthetic Biology Workshop, NASA Ames, Moffett Field CA, October 30-31, 2010. Bio-design automation and synbio tools, August 2, 2009, Bio-Design Automation workshop, San Francisco CA, July 27, 2009. 7th Annual World Stem Cell Summit, Pasadena CA, October 3-6, 2011, summary, journal article. Status of stem cell research, September 27, 2009, 5th Annual World Stem Cell Summit, Baltimore MD, September 21-23, 2009. Crowdsourced Labor, Digital Marketplaces, and the Future of Self-Actualized eWork, November 5, 2012, CrowdConf 2012, San Francisco CA, October 23, 2012. Singularity Summit 2012: Image Recognition, Analogy, Big Health Data, and Bias Reduction, October 21, 2012, Singularity Summit 2012, San Francisco CA, October 13-14, 2012. The Evolution of the Quantified Self into the Qualified Self and the Extended Exoself, October 14, 2012, Quantified Self Conference, Palo Alto CA, September 15-16, 2012. Sensor Mania! TechCrunch Disrupt Hardware Day!, September 12, 2012, TechCrunch Disrupt, San Francisco CA, September 9-12, 2012. Quantization trends of the future: crowdsourcing and geolocation, November 10, 2011, CrowdConf2011 (November 1-2, 2011) and Geo-Loco (November 3, 2011), San Francisco CA. Microbubbles and photoacoustic probes energize cancer researchers, May 30, 2010, Canary Foundation symposium, Stanford CA, May 25-27, 2010. Status of cancer detection, May 10, 2009, Canary Foundation symposium, Stanford CA, May 4-6, 2009.